After a long wait, the end of last week brought with it the arrival of my new BCNW-O1 bushcraft knife. 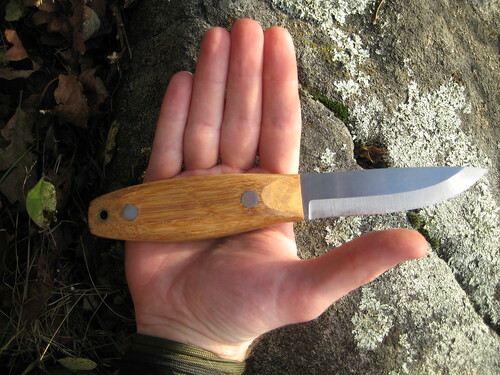 In late August, I had put aside some money for a new bushcraft knife. For quite some time, I had had my eye on a Skookum Bush Tool. Yet, over the summer I discovered Mike Lummio’s Bushcraft Northwest through his YouTube channel. One of his videos features his knife, the BCNW-O1. It has a very similar design to the slightly larger Skookum, which make it difficult for me to decide which I preferred. The knife was listed as back-ordered on Mike’s web page, so in the beginning of September I emailed him, asking when the knives would become available. My intention was that I would purchase whichever of the two knives became available first. Mike initially told me 2 weeks. That got delayed to 2 months, due to a batch of special order knives with a sharper grind coming in first and his moving the school to a new location. Still, it was available sooner than the Skookum, so I decided on the BCNW-O1. It was well worth the wait. I couldn’t be happier with the knife. As the name implies, the BCNW-O1 is made of O1 tool steel. O1 is a relatively high maintenance material, somewhat soft when compared to other metals such as A2, and more prone to rust if not properly cared for. But the steel can be more easily sharpened to a razor edge than others, and can strike a spark off the backspine with a piece of flint (in addition to the more common ferrocerium rod). 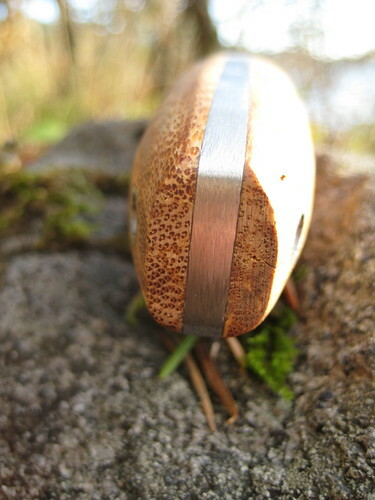 Because of this, O1 is quite popular in many bushcraft knives, including the famed Woodlore knife. Perhaps the most unique aspect of the knife is the handle. 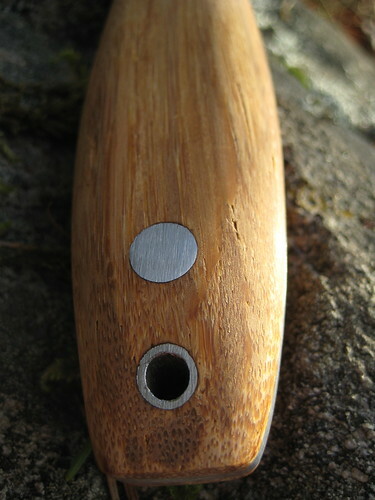 It’s made of bamboo “that has been processed much like micarta. The individual fibers are separated and then bound together under pressure with an industrial strength, formaldehyde-free adhesive. This material can withstand 3,000 psi and is very resistant to the elements while being made from a sustainable resource.” The handle is very smooth, lacking the unique texture of micarta. It feels more like a normal wooden handle, which I love. 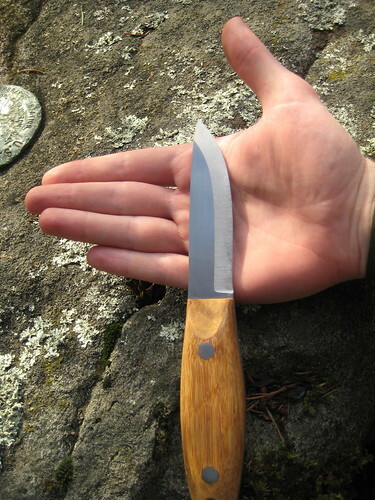 One of the things that I don’t think is demonstrated very well by the photos on the Bushcraft Northwest site is the size of the handle. It’s a bit bigger and chunkier than what it looks like, which provides for a very comfortable grip. It fits perfectly in my hand. 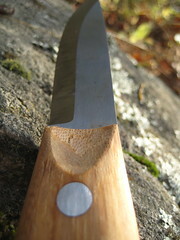 In addition the the handle material, the thumb scallops that are carved into either side of the handle are rather unique. This is an excellent feature that assists in certain carving grips, as demonstrated in Mike’s video. The knife comes with a leather Scandinavian style sheath (available either with or without a firesteel holder) made by JRE Industries. I’ve used one of these with my Mora knives for a couple years and greatly prefer them over any other style I’ve tried. 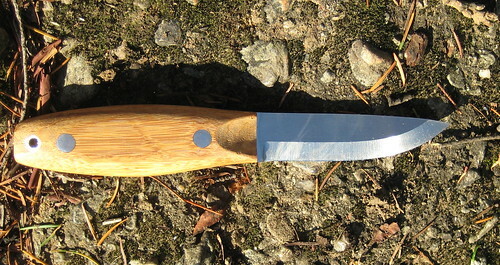 Most any bushcraft knife made today owes its design, in some part, to Mors Kochanski. Though not as well known as Ray Mears, Kochanski in generally considered to be the father of modern bushcraft. 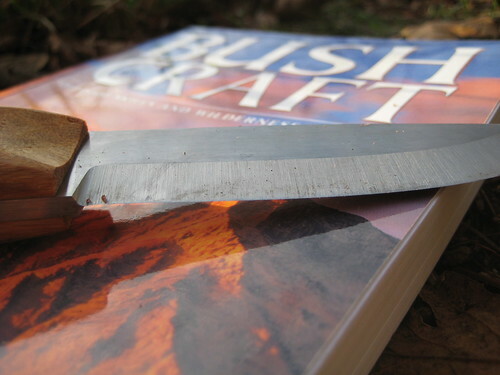 In the spirit of Schwert’s introduction to the Skookum Bush Tool in Outdoors Magazine, I’ll introduce the BCNW-O1 with excerpts from the Knifecraft chapter of Mors Kochanski’s Bushcraft. The general-purpose bush knife should have a blade as long as the width of the palm, although blades half or twice this length are within acceptable limits. A blade five centimeters long would be an excellent survival knife except for being too small to fall and limb trees of wrist-thickness. 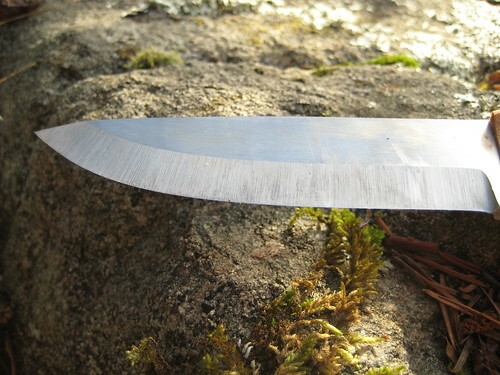 A blade 10 to 15 centimeters long will do intricate work like carving a netting needle, yet be large enough to present a good target for a baton when cutting down small trees. A blade 20 centimeters long is a superior tool for heavy work, but awkward to use for fine work. All general-use knives should have the blade tip close to the profile centerline of the handle. The back of the handle and the back of the blade should be on the same line. The back of the blade should not be thinned down or sharpened so that a baton can be used more effectively without being cut up. There is no advantage to a two-edged blade in bush living. The blade should be of a good quality carbon steel, from two and a half to three millimeters thick and about two to two and a half centimeters wide. This size of blade is light in weight, yet difficult to break. The steel should be soft enough to be maintained at a shaving edge with common sharpening tools, without frequent sharpening. Such steel is found in Mora (Sweden), Solingen (Germany) or Sheffield (England) knives. Carbon, unlike stainless steel, can be used as the striker in the flint and steel method of fire-lighting. Inexpensive stainless steels have had a bad reputation with respect to producing a keen edge let alone holding it. The Mora stainless steels however, are every bit as good as their carbon steels. 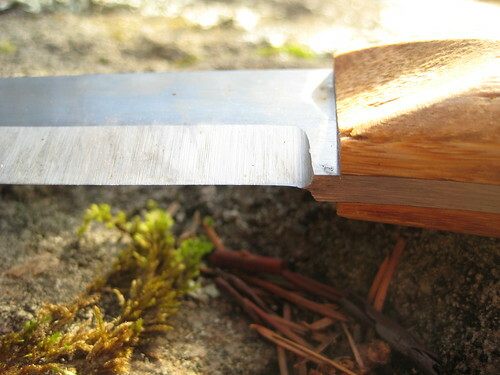 The metal of the knife blade should extend for the full-length of the handle (a full tang) for strength. The handle should be a durable, water-resistant material that can be shaped to the user's hand if necessary. 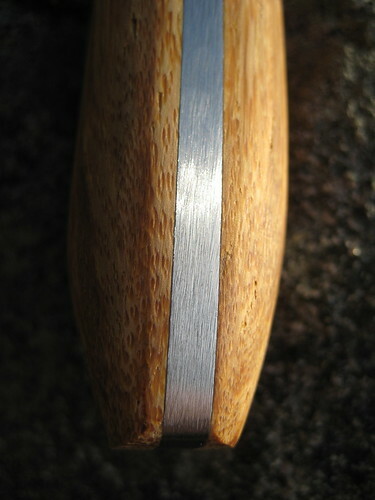 The knife should have a strong pommel that will protect the handle if the knife is driven tip first deep into wood. 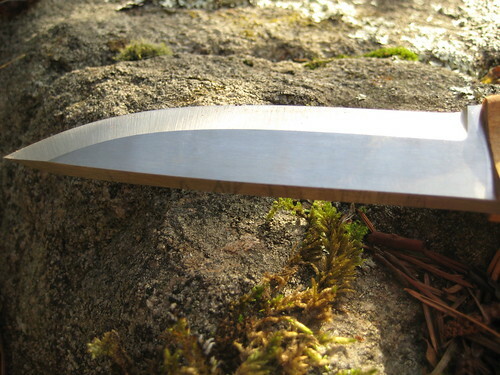 The curvature of the cutting edge should extend for the full-length of the blade. This cuts well and is one of the best shapes that quickly sharpens to a razor's edge. 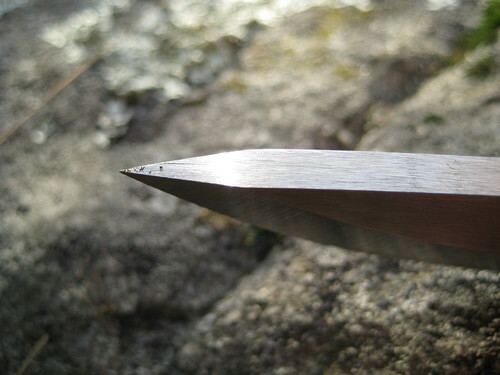 The knife blade should have a sharp enough point to penetrate deep into wood with a minimum of effort. The knife handle should be about as long as the width of your palm. A handle that is too thick or too thin fatigues the hand and causes blisters. The cross-section of the handle should be an oval instead of round or rectangular. An oval handle provides an adequate indication of the direction of the cutting edge and raises fewer blisters than handles with angular or rounded corners. A guard on a bush knife is in the way and detracts from many operations. It prevents the use of a simple, secure deep sheath. Some people prefer a guard for fear of slipping forward onto the knife edge, but unless the knife is used for stabbing, the hand should never slip in this way. In all my years of instructing I do not recall an injury due to the lack of a guard. The BCNW-O1 clearly meets all of Kochanski’s criteria for the perfect bush knife, as well as introducing new innovations of its own. Though I’ve not had it long enough to perform a full review, I am extremely pleased with the knife. It has exceeded my expectations. I can safely say that I wouldn’t trade it for any other knife. Additional photos of the knife are on Flickr. This post was published on 2008-11-15 . It was modified on 2012-09-15 . It was tagged with gear, fire, review, bushcraft, survival, knife.